One of the biggest headaches for anyone who works in a creative field that uses high-powered computer systems, such as working on demanding NLE’s or animation programs, is how quickly the technology changes. Unfortunately, as anyone who works in a creative field knows, it’s almost impossible to keep up with those changes. 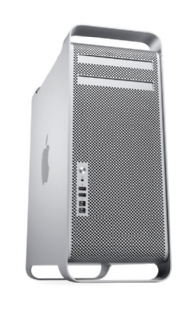 Dennis Radeke is a music composer for the entertainment industry, and was faced with the fact that his 2007 Mac Pro was – well – old. Usually at this point, it’s time to buy a new computer altogether, but Radeke decided to take a look at his computer. His Mac Pro had already gone through several enhancements by purchasing RAM from OWC (Other World Computing) of four-1GB, two-2GB, as well as two-512MB units. The computer had stopwatch boot time of 52.75s, 50.68; 5GB drive performance of 68.4/61.0MB/s; drive read of 69.2/60.1MB/s; CineBench CPU score – 566cb; and opening of “Groove Song” with Logic already open – 21.95 seconds. 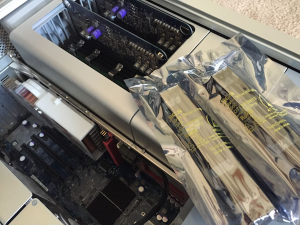 To improve processing performance, he added another upgrade of RAM (8GB) to his Mac Pro, and replaced the unused optical drive with a 1TB Mercury Electra 6G SSD. The upgrades gave him a stopwatch boot time of 29.38, 28.86; 5GB drive write at 238.6MB/s; drive read at 256.4MB/s; CineBench CPU score – 562cb; opening “Groove Song” 4.97 seconds; opening logic 9.1.8 plus “Groove Song – 10.69 seconds. I’ve also personally used OWC to upgrade my Macbook, which was slowly dying. It went from a 500GB HDD; 2GB RAM white plastic Macbook, to a 1.5TB drive, 16GB RAM machine. The optical drive was removed, and I also purchased an external enclosure to install it into. The site provides easy-to-follow video tutorials and instructions, so even the neophyte can easily do the upgrades themselves. They’ll even send you a small toolkit with all the necessary screwdrivers to take the computer apart. One caveat, however, is that your computer is still at the mercy of your CPU power. I had to eventually sell that Macbook and upgrade to a Macbook Pro, because some intense processing power was required for my live music rig. The laptop lasted a full six years, and is currently still going strong in my friend’s care ,where I suspect it will be good for another three or so years, since it’s not being used for any heavy lifting anymore. If you do need to buy a new Mac, then I recommend purchasing a refurbished one from Apple. I used Geekbench to evaluate the relative processing power I needed, since newer doesn’t always mean faster. You could also buy a computer with a small hard drive and RAM to save money upfront, and then purchase upgrades from OWC, as sometimes that ends up being much cheaper. The bottom line is that if you find your computer is incredibly sluggish, you may be able to save quite a bit of cash by doing a few simple upgrades, rather than springing for a brand new computer. But sometimes, you have to bite that bullet and buy something. There are many great upgrade companies and website you can buy from. I have used, as have many of my doddleNEWS colleagues, OWC (link) for Mac. Check out this series by Jeremiah Hall on building a Windows NLE system here and here.